The second cohort of 23 women leaders were recently honored at the Leading Women@Tech closing ceremony for completing the program. The nomination period for the third cohort of the Leading Women@Tech program will open in April. Two members of the College of Sciences Dean's Office are members of the second cohort of the Leading Women@Tech program: Director of Administration Dian Chung and Director of Communications Maureen Rouhi. In addition, Julie Ancis, adjunct professor in the School of Psychology, is the program's co-director. Leading Women@Tech Session, "Women and Leadership"
Leading Women@Tech Session, "Women: An Intercultural Dialogue"
“Supporting women, especially the brilliant and courageous colleagues I met in this program, is one way to help Georgia Tech realize authentic inclusive excellence in its leadership ranks,” said Maureen Rouhi, director of communications for the College of Sciences. The second cohort of 23 women leaders were recently honored at the Leading Women@Tech closing ceremony for completing the program. Honorees included Joeleen Akin, Donna Ashley, Marisa Atencio, Lori Brown, Dian Chung, Carla Gilson, Amy Herron, Jennifer Hirsch, Tiffiny Hughes-Troutman, Maria Hunter, Cynthia Jennings, Keona Lewis, Connie Masters, Patrice Miles, Cynthia Moore, Susan Morrell, Pamela Rary, Mia Reini, Maureen Rouhi, Jana Stone, Kimberly Toatley, Michelle Tullier, and Kate Wasch. With support from the Office of the President, Institute Diversity launched the Leading Women@Tech program to facilitate women’s professional development and academic and administrative leadership, and to build a community of leaders across the Institute that will advance a culture of inclusive excellence. Over 10 months, 10 program faculty, comprised of national and international thought leaders and expert coaches, facilitated sessions or provided individual leadership coaching in the areas of efficacy, emotional intelligence, strengths-based leadership, intercultural communication, mindful leadership, multiple role management, career vision, and other aspects of navigating the complexities of work-life integration. “We appreciate the institutional support from the Office of the President and Institute Diversity, supervisors of the participants across the Institute, the excellence of our partners, and the stellar guidance of our advisory board members to proactively define the next generation of leaders at Georgia Tech,” said Pearl Alexander, executive director of diversity, inclusion, and engagement and co-director of the program. Advisory board members included Maryam Alavi, dean and Stephen P. Zelnak Jr. Chair, Ernest Scheller Jr. College of Business; Terry Blum, faculty director, Institute for Leadership and Entrepreneurship; Errika Moore, executive director, Technology Association of Georgia Education Collaborative; and John Stein, dean of students and vice president, Student Life. In addition to Alexander, Cheryl Cofield, director of inclusion and engagement, served as an executive coach. The nomination period for the third cohort of the Leading Women@Tech program will open in April. More information will be available in the coming weeks. 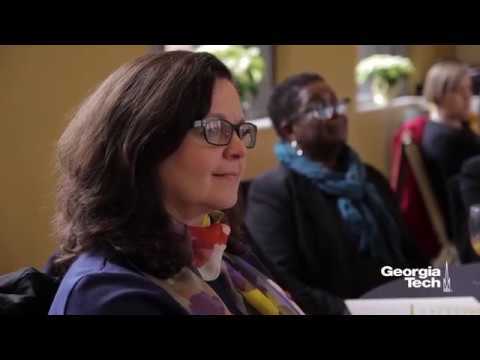 To view the Leading Women@Tech video about the second cohort’s experience, visit https://youtu.be/Uk3xZOPthu8. For more information on Leading Women@Tech, visit www.diversity.gatech.edu/leadingwomenattech. Editor's Note: This item was adapted from the article published on Feb. 22, 2018, by Institute Diversity.